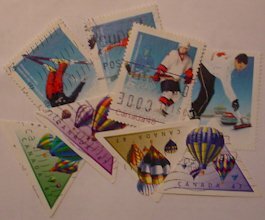 If you need stamps from Canada we have got them ... everything from the very old ones to the newest issues. Please send us your want list. Click here and you will be able to use Scott Catalogue numbers for your Canada want list. We also have thousands and thousands of world wide duplicates in our collection. Click on the links above to see what we are looking for and what we have to offer. These lists are still under construction and not all countries are represented. Please email us for information on other Countries. We have different ways that we can send you our stamps. We can exchange packages of 50, 100, 200 or more. We can arrange trades based on want lists and catalogue values. We can obtain mint Canadian new issues. Please email us if you would like to arrange a trade.